1.Begin by making sure that the metal tin is clean with no sharp edges. 2.Paint a layer of your chosen Deco Art colour onto your tin in even strokes with the First Edition nylon brush. Leave to dry and paint on another layer to create a dense and vibrant finish. 3. Once dry, paint a fun pattern on top with an alternative Deco Art paint colour with a thinner paint brush. 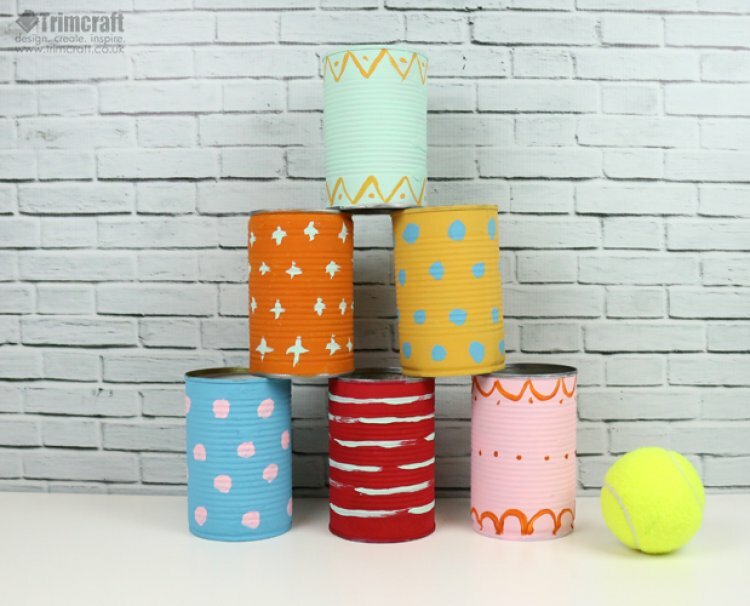 4.When you have completed your first tin, place to the side and repeat the same steps with five more tins, ensuring to alternate the colours and patterns. Now It’s time for some friendly competition and in this lovely weather, the kids will have a fantastic time playing with this outside with their friends! We’d love to see your Skittle designs so remember to upload your designs to the project gallery and to #Trimcraft on social media.